With a career that spanned over four decades, the Hermanas Padilla became known not only for their harmonies, but also for their emotive interpretations, which were both soulful and joyful, impassioned yet restrained. 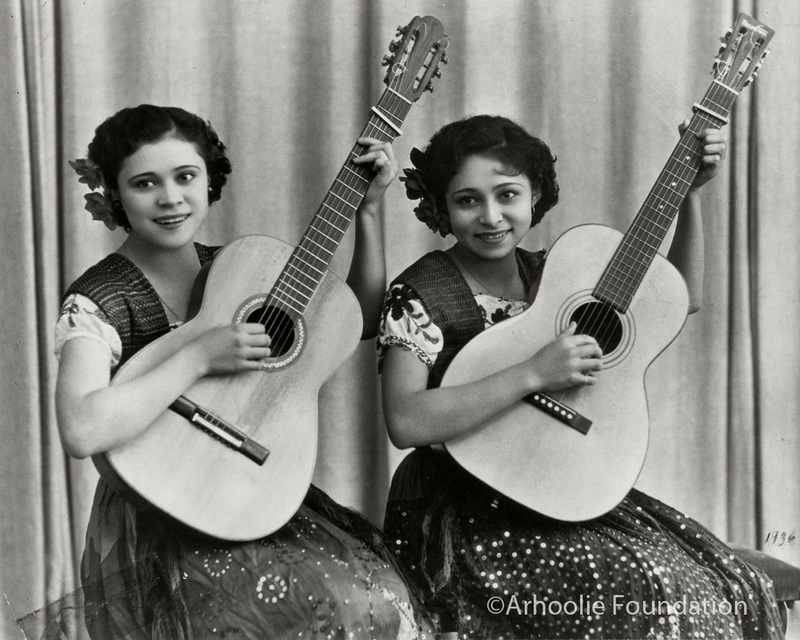 The sisters became the first female vocal duet from the United States to hit it big on both sides of the border, influencing a generation of similar duet acts that gained wide popularity among Mexican and Latin American audiences in the mid-20th century. Despite their fame and influence, biographical information on the singing sisters is scant and scattered. Wikipedia has a short entry on them in a language that appears to be Breton, though oddly enough, there is no entry in English or Spanish. There is a smattering of biographical data on miscellaneous music websites, and a good summary of their career in Barrio Rhythm: Mexican American Music in Los Angeles, written by UCLA ethnomusicology professor Steven Loza. Among his sources, Loza cites liner notes written by Philip Sonnichsen for the Folklyric LP Los Primeros Duetos Femeninas (sic): The First Women Duets (1930-1945), released in 1984 by Arhoolie Records. The Padilla sisters hail from the town of Tanhuato in the western part of the state of Michoacán, near the border with Jalisco, considered the birthplace of the mariachi. Lead singer Margarita Padilla Mora was born in 1918, and her harmonizing younger sister, María Padilla Mora, was born two years later. The family came to Los Angeles in the 1920s at a time of intense government persecution of the Catholic Church, which led to the Cristero Rebellion. Devout Catholics, the parents of the Padilla girls decided to flee across the border after being threatened for protecting priests. The girls began singing together at an early age, encouraged by their father who would pay them five cents for two songs and ten cents for long corridos. During the 1930s, they became popular at neighborhood fiestas and talent shows, including fundraising benefits for local churches. “Their first formal recognition came when they won first prize in a talent contest held in a park in Pico Rivera,” writes Loza. “Soon afterword they appeared on the Los Angeles-based radio show of Ramon B. Arnaiz, where they started singing with Chicho Y Chencho,” who were part of the popular L.A. radio act Los Madrugadores (The Early Risers). In 1937, the Padilla sisters made their maiden recording, the hit “La Barca de Oro”backed with “Por Qué Será.” The record became “an instant success,” according to the album notes for the Women Duets disc. The Hermanas Padilla learned most of their early repertoire from their mother and grandfather, as well as directly from artists who were invited into the family home while appearing at a neighborhood theater. They knew almost a thousand songs by the time they first started performing on Los Angeles radio in the mid-1930s. “The duet made some of the very first recordings in the United States of mariachi music featuring trumpet, frequently teaming up with virtuoso classical trumpeter Rafael Méndez,” according to mariachi musician and historian Jonathan Clark, writing in the chapter about mariachi music in The Strachwitz Frontera Collection of Mexican and Mexican American Recordings. Their recording sessions were often accompanied by non-mariachi studio musicians specifically assembled for the dates, Clark adds, “since no local mariachis of sufficient caliber” were available in Los Angeles during this early stage of their career. Many of those early recording sessions were directed by Manuel S. Acuña, a leading figure within the vibrant Mexican-American music community of Depression-era Los Angeles. Acuña, also immigrated to the U.S. from Mexico in the1930s. As composer, arranger, and producer, he was largely responsible for building the early career of the Hermanas Padilla. Originally recording on Vocalion Records, the duet went on to make dozens of records for both Columbia and RCA. With more than 400 recordings in the Frontera Collection, the Hermanas Padilla rank No. 5 among the artists with the highest number of discs in the database. Their high ranking reflects the personal priorities of the collection’s founder, Chris Strachwitz, who has a special fondness for the singing style of Mexican duets, and picked up their records wherever he could find them. During the bracero program of the 1940s, the Mexican Consulate, which provided Mexican entertainment for the workers, asked the Padilla sisters to sing at the bracero camps. The duet’s popularity increased with the introduction of the jukebox (sinfonola) in clubs, bars, and restaurants throughout the Mexican sectors of the city. The sinfonolas often contained more 78 r.p.m. records by the Padilla sisters than by any other artists. The Padillas also performed at the Million Dollar Theater, where they were featured in American variety shows along with such stars as Red Skelton, Abbot and Costello and the Ink Spots. Soon after the end of World War II, wedding bells rang for both Margarita and Maria. Coincidentally, the sisters married fellow artists they met through their working relationship with Silvestre Vargas of the famed Mariachi Vargas de Tecalitlán, which often provided the accompaniment on their records. Vargas introduced Margarita to her future husband, Victor Cordero, who would go on to write scores of popular songs, including two of the most famous corridos of all time, “Juan Charrasqueado” and “Gabino Barrera.” They were married in 1945. The following year, Maria married Memo Quintero, a violinist with Mariachi Vargas. Subsequently, newlyweds Memo and Maria began recording as a duet, known as Dueto Azteca. Initially, their work was released on Discos Azteca, also based in Los Angeles, but they went on to record for the Imperial and Columbia labels, gaining international recognition in their own right. One of the duet’s final public performances took place in November 1980 at the Teatro Blanquita in Boyle Heights, the immigrant neighborhood east of Los Angeles, in a program billed as an homage to their career. NS: Thanks for the clarification, though the language is still a puzzler. I've added another link to a Spanish website, for interested readers. Thanks for your careful attention to our content. Just for info, the Wikipedia article you link to is in Breton.